In this course you will learn why cyber criminals want protected health information, also known as PHI. And you’ll gain an understanding of the HIPAA/HITECH requirement and the current state of HIPAA compliance. 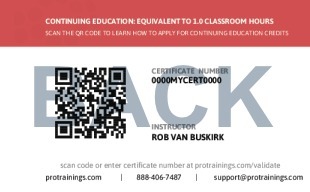 This course will showcase, why PHI is so valuable to cybercriminals, current data breaches, current industry fines, the importance of encrypted email and your responsibilities under the law. In the leadership portion, you will learn why a risk assessment is required, what is the HITECH regulation of 2009, and the omnibus rule of 2013. We will also cover the importance of customized policies and procedures to create your Book of Evidence, and why a business associate agreement is required. We will also review the types of violations we see in the industry today, and why you as the compliance or privacy officer are key to winning with compliance. We will also review how to handle a complaint and an audit from the Office for Civil Rights or attorneys. 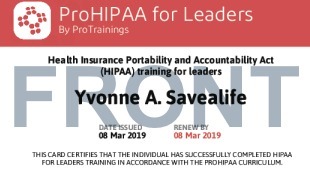 The course objective is to educate you on the importance of understating the government requirement, the current state of HIPAA/ HITECH and the obligations under the law. You will come away with an understanding of how to protect and properly handle PHI and ePHI. Total course time includes 59 minutes of video training as well as knowledge reviews, final test, remedial help and reviewing downloaded material. Do I need a Privacy Officer or Security Officer? What do I do if I get a HIPAA Complaint? What is an Audit and how do I handle it?